I’d make a rubbish spy, if this trip was anything to go by. 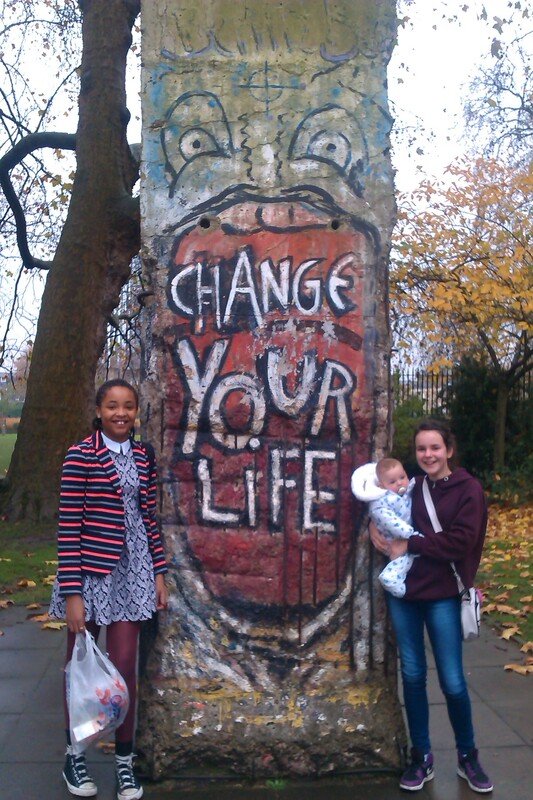 I forgot to check the route to the Imperial War Museum before sitting down on the tube, and left the camera at home! Apologies for the poor quality mobile snaps in advance – let’s pretend I wanted to give this post a reconnaissance feel. 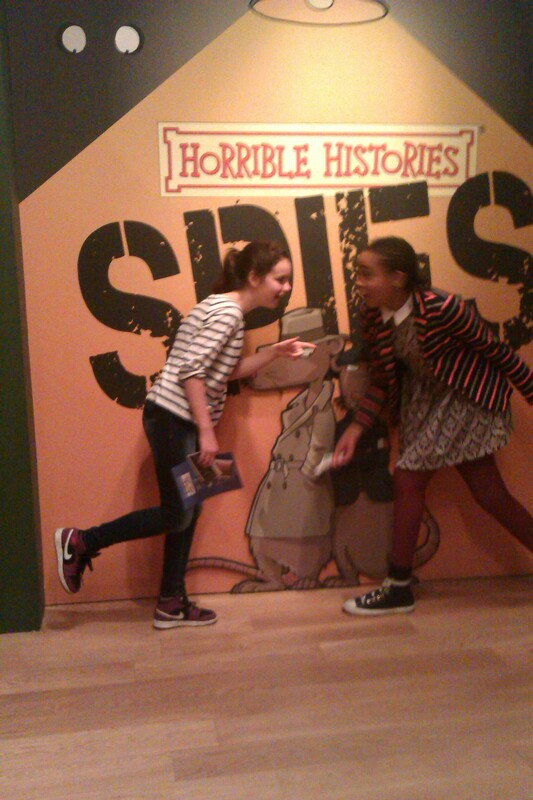 I also found out not only had both my daughter and friend already visited Horrible Histories: Spies, but they hadn’t been that impressed by it. When did that happen? With school. Why did nobody tell me about it? Oh, my signature was all over the permission slip (I must have instantly forgot about it). Thankfully, the Second World War had much more, um, reliable secret agents, and on their second visit – without dozens of other school kids to distract them – the girls had a fantastic time. Horrible Histories®: Spies tells the story of Second World War spies and spycraft, including codes, camouflage and forgeries. Don’t be fooled by the cartoon-like graphics – all of the facts and people are real. Just like the bestselling books and TV series of the same name, this exhibition focuses on the fun, horrible bits of history – so not only will your child enjoy themselves, they’ll learn something too! We are introduced to six ‘super spies’ who all performed amazing feats of bravery and endurance during the Second World War. They are each introduced with their real name, codename, and special skill. We find more about each one throughout the exhibition – in particular, my daughter and friend loved reading what happened to them after the war. 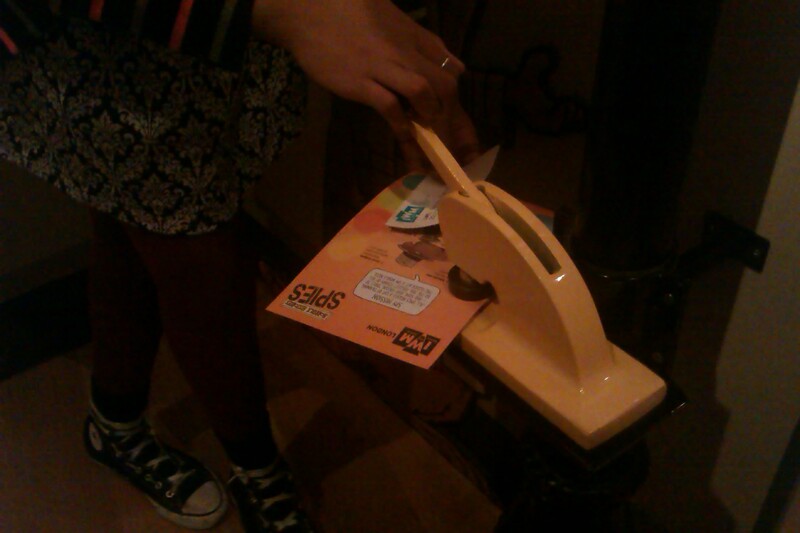 A trail leads you through the exhibition’s eight themes, with a stamp to collect from the retro looking lamppost in each area. 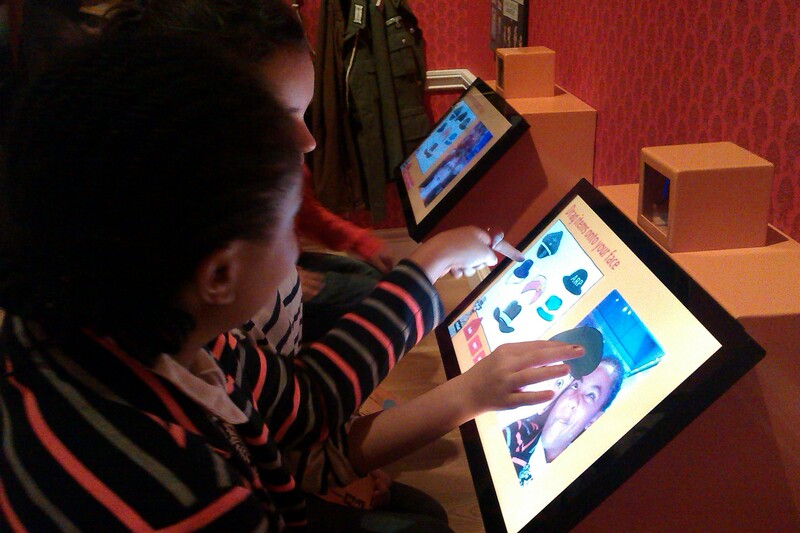 Each stamp refers to the main message of the zone, so it’s an educational as well as fun hands-on activity. 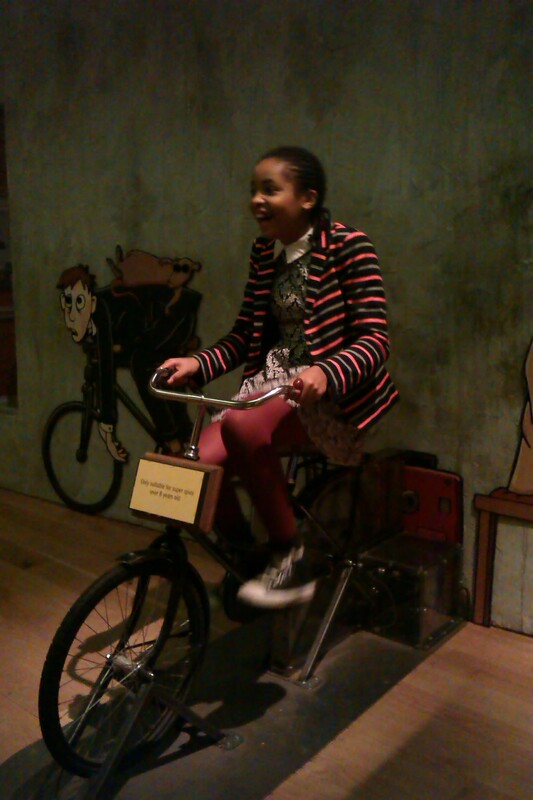 The exhibition is packed full of quality interactives – the girls’ favourite activities being the cycle-powered radio, the disguise photo-booth and the various quizzes. 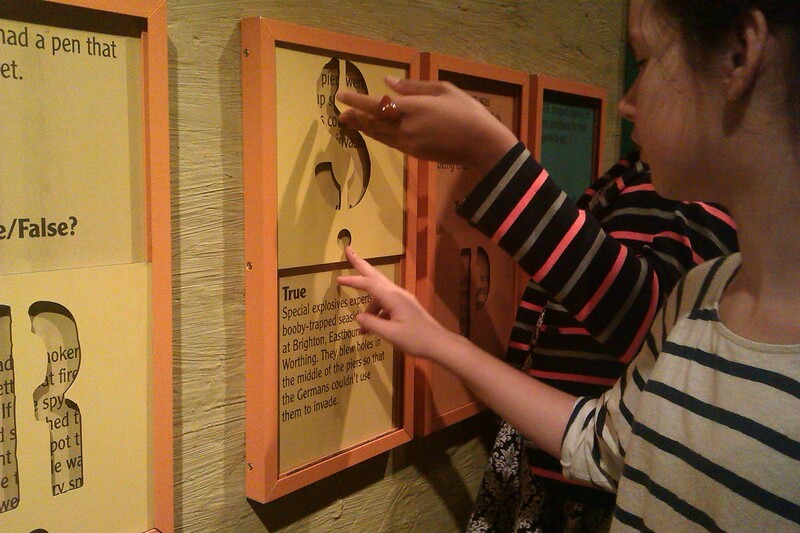 Visitors are encouraged to use their senses – from smelling ingredients for invisible ink to listening for real secret messages in seemingly innocuous radio broadcasts. There are also clips from the Horrible Histories TV series to watch too. The only interactive which felt a little spurious was the projection of exploding ‘rats’ onto the floor for visitors to jump on. 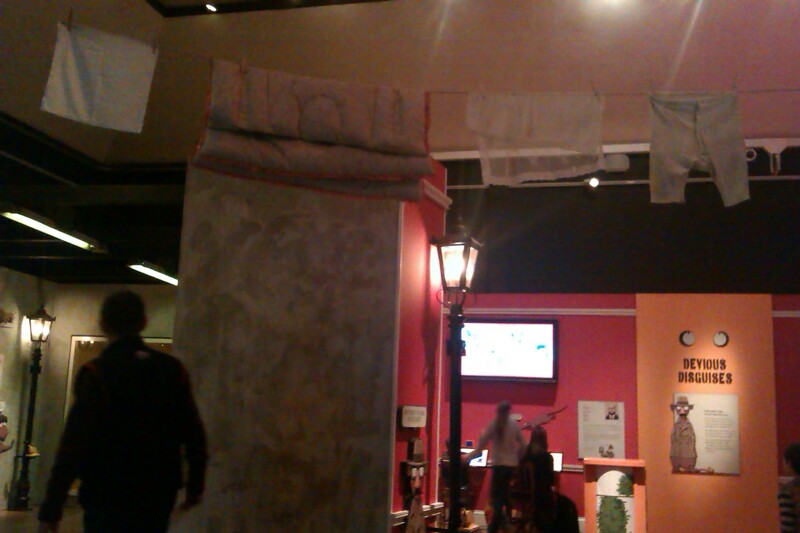 Having seen a nearly identical interactive in the earlier Horrible Histories: The Trenches exhibition, initially I felt as if they were recycling content better suited to a different story. But history triumphed – I found there was a spy link with the suggested use of explosives in rats. 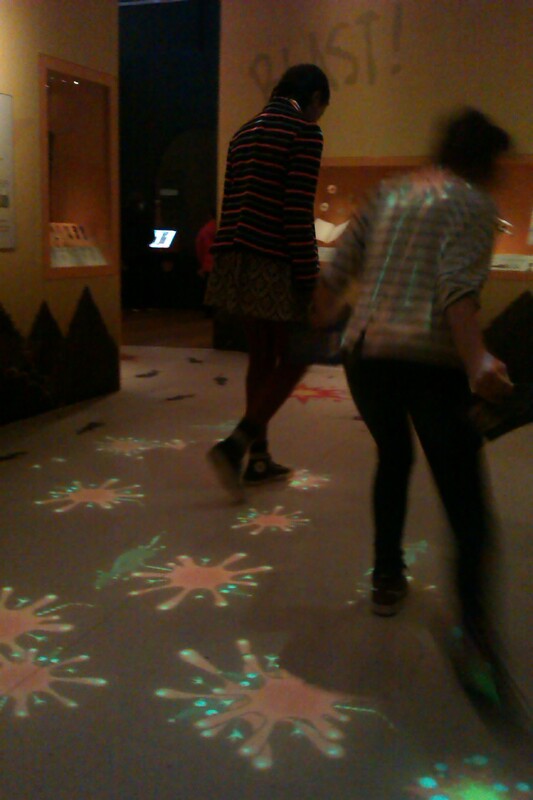 Plus the girls loved stepping on the digital pests too! No army landings here, sir. Just people with massive bare feet. Given the drawing and narrative style, there is a risk that the stories could seem a bit fantastical – but the presence of real objects really help remind the visitor of the history behind the exhibition. The girls’ favourites included the fake feet put on top of boots so that those involved in beach landings would leave foot- rather than boot-prints on the sand. They also loved the fake Hitler passport created by the Special Operations Executive to showcase their fantastic forgery skills. 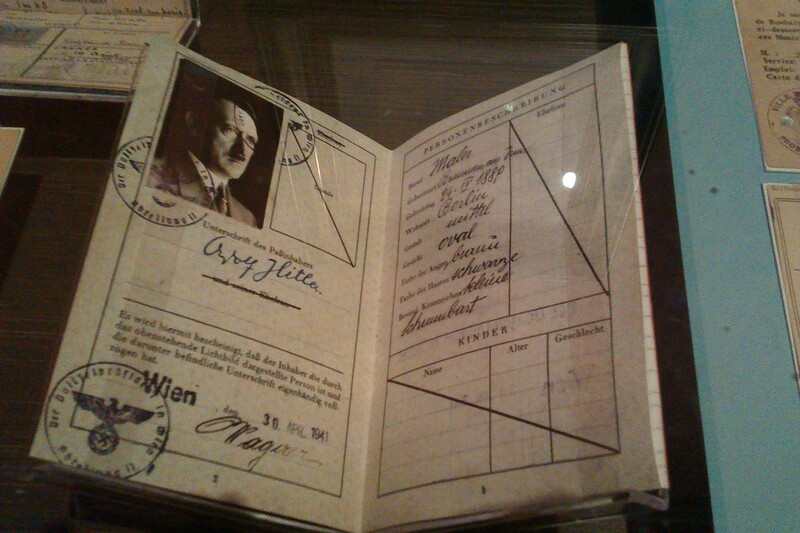 Hitler’s passport. Or is it? At times it all gets a little Bond-like – a secret spike letterbox, a prototype smoking pipe gun and a biscuit tin radio feature in the displays. But it was the ingenious use of washing on the line to pass messages over the enemy lines which most impressed me. I’ll never look at laundry in the same way again! Handkerchief. Eiderdown. Linen. Pants. Story of my life. The quizzes at the end helped remind the girls of what they’d seen (or learnt by stealth), one of which is available to take at home: http://www.iwm.org.uk/games/super-spy. All in all, it was a great space to allow children to explore and enjoy, and without the crowds of the rest of the museum. It was fun without being frivolous – the spies’ stories and special gadgets show the ingenuity and bravery involved to help win the war. If you’re looking for somewhere warm and easy to take the kids to this Christmas, this is perfect. Just bring your camera, and check the route before you get on the tube! NB – The Imperial War Museum has been newly refurbished – look out for a fuller post soon! The exhibition tickets were complimentary from the Imperial War Museum for review purposes. All thoughts and opinions are my own. Open daily 10am-6pm, last admission 5.30pm. Booking: Book online and save 10% or buy from ticket desk on day. Recommended length of visit: I’d say you’d need about 45 mins to an hour for the exhibition, although to our surprise we managed nearly 2 hours! Buggy accessible? Yes, there are four lifts at the rear of the museum to take you up to the exhibition floor. Top tip: the West Entrance gives a step free route to the main hall. This is to the right side of the museum, in the park and past the cafe terrace. Baby changing: Two facilities are available on the ground floor, one near the West Entrance and one in the reddest toilet you’ll ever go in, underneath the main entrance. Both have fold down tables (the red one had a strap) and an adult toilet inside too. Breastfeeding friendly? : It’s quite dim, not too busy and has a few places to sit so I was able to feed the little one. Toddler time from exhibition to toilets: Yikes, not good. If you had the buggy, you’d have to wait for a lift, then would recommend using toilets near West Entrance as there were queues to the other ladies’ toilets. Give a good, nerve wracking 4 minutes. Nearest playground: The IWM is surrounded by Geraldine Mary Harmsworth park which includes a small playground with swings, climbing frames etc. There’s also a brick hut which hosts playgroups during the week – see https://www.facebook.com/OasisWaterloo and http://www.oasischurchwaterloo.org/hullabaloo for more information. Food: There’s a nice cafe run by Peyton & Byrne and a tea room in the summer months too. We had our lunch outside in the park. Want to make more of a day of it? : There’s the rest of the Imperial War Museum to explore – including the stunning atrium, A Family in Wartime exhibition and the showcase galleries on the First World War. I’d be tempted to walk 20 minutes to the South Bank and show the kids the River Thames, the London Eye, the Houses of Parliament and the street performers. There’s usually lots of fun stuff going on at the South Bank Centre. Thanks for commenting! 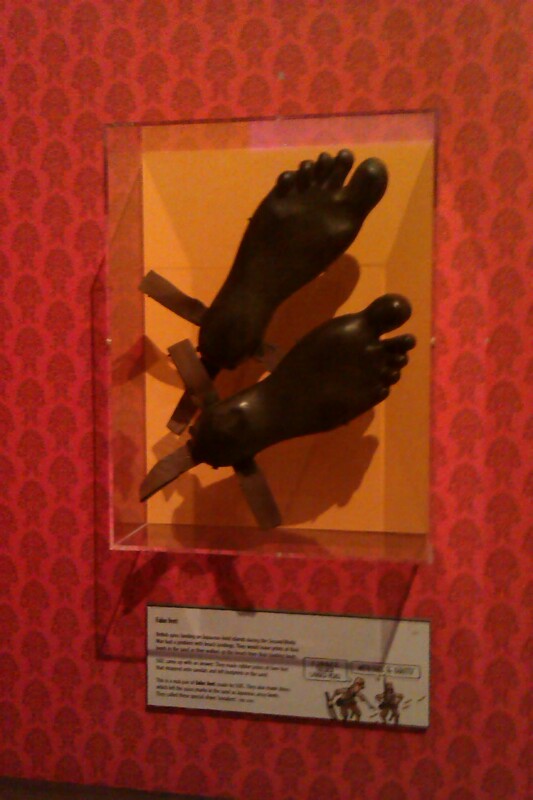 Am looking forward to the next Horrible Histories exhibition already!